Phase I: Funded by the BBSRC Exploiting Genomics initiative, from May 2002 to February 2007. Phase II: A collaborative programme started in 2008, coordinated by Prof Sylvia Richardson. Previous Projects: Bayesian Gene eXpression is a collaborative project between three teams to develop a series of flexible statistical models that can be used to obtain more information from microarray experiments. Please use the menu above to navigate our site. Our aim is to develop a series of flexible statistical models that can be used to obtain more information from microarray experiments. These models will capture essential features of microarray data and return probabilistic information on the underlying groupings within the data. We will work within the generic framework of Bayesian hierarchical models that has proved successful for analysing many types of complex biomedical data. Inference on the parameters of interest will be based on their posterior distributions and be implemented using stochastic algorithms of the Markov chain Monte Carlo (MCMC) family. 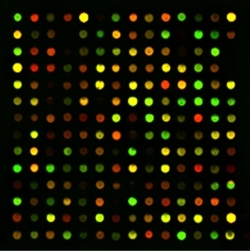 Statistical modelling of the microarray data will provide an interface between theoretical and experimental work and will be used to: (a) identify of sources of error and variability in current methodologies; (b) inform experimental design; (c) develop new technologies and tools for post genomic biological research. The data analysis tools generated will be incorporated into the Microarray Centre data-warehouse, thus facilitating transfer of knowledge to researchers and strengthening interactions between statisticians and biologists in the generation and analysis of microarray data. Current Projects: The Bayesian Integrative Genomics research project has for ambition to propose efficient implementation of multivariate models and tools for the joint analysis of genomics data sets, in order to facilitate novel and more powerful strategies in integrative genomics. Our modelling and computational approach to Integrative Genomics is based on several components. Central to this project is the task of building efficient methods for sparse multivariate analysis of highly dimensional data sets. The backbone of our modelling strategy will be on three complementary broad classes of methods, namely methods that operate variable selection in high dimensional space, methods that uncover joint features through sparse latent factors models, and methods that use partitioning and clustering to look for associations.